We've got a growing collection of original Canada Day colouring pages here at Activity Village, including some really special new pages including some word art and a group of kids celebrating - great for older kids. We also have a colouring flag and flag bookmarks to colour, We hope you enjoy them! This very detailed colouring page features children celebrating Canada Day. Download a high quality pdf file on the link below. Here is a set of doodle colouring bookmarks for Canada Day in two designs - great as a group or classroom activity for older kids. Colour in our cheerful colouring page to celebrate Canada Day. More Canada Day Colouring Fun! 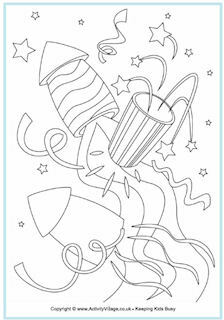 A fun collection of fireworks colouring pages for all occasions! 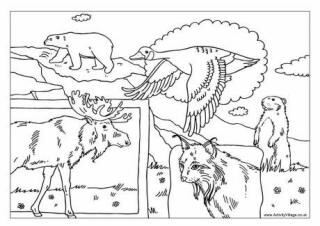 In our collection of Canada colouring pages you will find a collage of Canada's famous wildlife and colouring pages based on Canada's favourite sports, ice hockey and lacrosse and much more besides!